Some say “love” is the greatest word they know. Others say “God” is. I’ve had favorite words over the years too, but “why” beats them all. So I ask myself, why continue posting these observations? It’s certainly not for money. Is it for fame? I actually prefer anonymity. In fact, years ago when my yoga students showed hints of ‘guru worship’, I went out of my way to discourage that. Do I just need to vent? Well, there was some of that urge early on, but I’ve pretty much said all I really need to say. So why continue? One reason is the art and challenge of it. My most intriguing observations pop into my mind during my morning yoga headstand, while soaking in the bath, and in dreams during the night. I suppose that’s the art of it. Writing them well enough to resonate with someone else is the challenge. I don’t suppose this is any different from playwrights, for instance, who dream up scenarios and write plays. Posting my observations is like putting on a play… way, way, way off Broadway, of course. Okay, I suppose that answers why I continue to write, at first glance anyway. Yet, “why” lingers on. But of course, “why” would unquestionably linger on. It is the deepest existential question of all… and ultimately unanswerable, at least from a Taoist point of view. 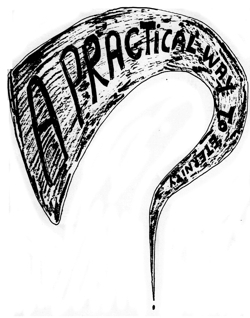 The question mark-like graphic for this post is the graphic I made for my first serious attempt at writing in 1976. My wife says the poems in the essay are her favorite part. At least they help lighten it up and make it more digestible. If you want to read that first attempt, see “A Practical Way to Eternity“. As I look over that first attempt now, I feel one reason I write is that I am working life out on paper, so to speak. I think of this as mostly ‘reinventing the wheel’ because what I discover is actually merely rediscovering what others have discovered throughout time. To me, that says the path to truth is universal and awaits anyone needing to make the journey — an endless journey, I imagine. It is interesting to see how much my thoughts have changed over time, yet not in some fundamental ways. Toward the end, I started placing an (x) when I really wished to disavow the ‘dumb’ idea I had back then, with an eye to updating it. Then I realized, what has changed over the 40 years is not anywhere near as important as what has remained more of less constant. Therefore, I have left it as is, except for attempting to correct spelling. The major change between then and now is my shift away from an advocacy of free will towards “mysterious sameness”. Still, if you are into free will, you may find the essay speaks to you, but again, keep in mind that it comes from where I was at nearly 40 years ago when I thought “A Practical Way” was merely a matter of free choice. Curiously, my son Luke said my writing back then, or at least earlier, was better than now. I can’t really believe that is true, as I’ve worked so hard over the last two decades to write as well as possible. Then it occurred to me that when you can really understand clearly and easily what a writer is saying, that writing would feel well written, and perhaps vice versa as well. My “A Practical Way” is easy to understand, very straightforward and written with a righteous flavor and style similar to the Bhagavad Gita, which I read daily back then. Below is the essay’s introduction. It gives the flavor of my thinking back then. Also decide it’s better to put up a fight! Most of us humans spend our whole lives finding fault with the “condition” of the world, marriage, government, job, life, and so on. We expect everyone to do the right thing and become annoyed when they don’t i.e. Nixon as president, communist repression, wife’s overspending, children’s misbehavior, worker incompetence, capitalist spoiling the environment, permissive society or too restrictive one, and so on. We insist on everyone doing their “best”. However, when it comes to taking care of, improving, nourishing our own body and mind, of ridding ourselves of the imperfections in our own personality and life, then we all of a sudden become very tolerant of faults and laziness. How can we ever honestly expect the outside world to be any different when we aren’t even willing to do our best for our own “inner world”? The “inner world” is one thing, the only thing, we really do have a chance to control and improve. Indeed, without the “inner world” what do you have? Death!! And those who care not for the “inner world” are living a “life in death”. An improvement in your inner world improves the whole universe by a small degree, depending on the extent of improvement. Buddha improved his to a high degree and so had a big effect on the world. If we all did our best for our inner world, the outer world would take care of itself easily. Therefore, we must cease blaming and finding fault with the “outer world” and do what we can for the “inner” one. I wrote this essay to help you and me towards this goal. I knew ‘eclectic’ but never looked into its roots, which I just did, and found them deep. Clearly, eclecticism has a small ‘t’ Taoist and not-tribal nature. Wikipedia say, “Eclecticism was first recorded to have been practiced by a group of ancient Greek and Roman philosophers who attached themselves to no real system, but selected from existing philosophical beliefs those doctrines that seemed most reasonable to them. Out of this collected material they constructed their new system of philosophy. The term comes from the Greek “ἐκλεκτικός” (eklektikos), literally “choosing the best” and that from “ἐκλεκτός” (eklektos), “picked out, select”. There is a mythical bird in ancient Vedic / Yogic tradition that flys about and only “chooses the best” from the crap lying all around. Does anyone out there know this bird? Alas, I have long forgotten its name, but I have used it as a model since I first read about it (I am a notorious name forgetter!). I just tried to google it; it is a needle in the haystack. Thanks for this essay on your inner world. I too am always trying to find, expand, clarify my inner world. For 2012 I am reading a verse of the Tao each week then writing my thoughts, etc. in a blog. http://sarahdoyle13.blogspot.com/. I found your blog because I was searching to see if anyone else is doing the same. I believe God/spirit/divine whatever you want to call it is found in eclecticism, thus my eclectic ramblings. Keep on writing, we are always better now than we were before…unless we aren’t. Why did cave men paint simple yet extraordinary images on cave walls? We all feel a sense of wonder at things of beauty, the things that defy our ability to describe by familiar names. If there is an irony to your art, it is that you attempt to use familiar names (words) to “paint” the nameless beauties that captivated you. I have wandered by this website for a few months now and wanted to post for the first time to express my gratitude for your efforts.